What kinds of diseases can be carried by mosquitoes? Mosquito-borne disease is rare in Illinois. However, mosquitoes can carry at least three encephalitis viruses that cause human disease. La Crosse (California) encephalitis is normally an infection of squirrels and chipmunks; in humans it affects mainly children. St. Louis encephalitis is an infection of wild birds; in humans it affects mainly older adults. In 2001, West Nile virus (WNV) was detected for the first time in Illinois in birds, horses and mosquitoes. West Nile virus, like St. Louis encephalitis, causes encephalitis primarily in older adults. Encephalitis is an inflammation of the brain that can be caused by arboviruses (viruses carried by arthropods, such as mosquitoes and ticks) or by other types of viruses. In Illinois, arboviruses are primarily transmitted to humans by the bites of infected mosquitoes. Most individuals who are bitten by an infected mosquito will experience no symptoms of the disease or will have only very mild symptoms. Approximately 1 percent to 2 percent will develop recognizable symptoms. Some persons may have mild symptoms, such as a fever and headache. Severe infection may cause rapid onset of severe headache, high fever, muscle aches, stiffness in the back of the neck, problems with muscle coordination, disorientation, convulsions and coma. Symptoms usually occur five to 15 days after the bite of an infected mosquito. Not all viruses that cause encephalitis are carried by mosquitoes. How can I help protect my family and myself from mosquitoes and the diseases they may carry? 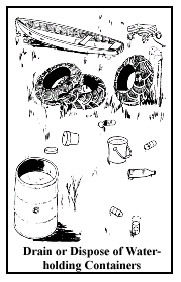 Dispose of discarded tires, cans, plastic containers, ceramic pots or other unused similar water-holding containers that have accumulated on your property. Do not overlook containers that have become overgrown by vegetation. At least once per week, empty standing water from containers on your property, such as tire swings, or bird baths. Drill holes in the bottom of recycling containers that are left outdoors. Drainage holes drilled in the sides of containers allow sufficient water to collect in which mosquitoes may breed. Turn over wheelbarrows and do not allow water to stagnate in bird baths. Change water in bird baths and wading pools on a weekly basis. Clean and chlorinate swimming pools that are not being used. A swimming pool that is left untended by a family that goes on vacation for a month can produce enough mosquitoes to result in neighborhood-wide complaints. Be aware that mosquitoes may breed in the water that collects on swimming pool covers. Fill in low areas on your property to eliminate standing water. Ponds or streams where fish are present or the water is disturbed by current or wave action do not produce many mosquitoes. It is not necessary to limit outdoor activities unless there is evidence of mosquito-borne disease in your area. However, you can and should try to reduce the risk of being bitten by mosquitoes. Wear shoes, socks, long pants and a long-sleeved shirt when outdoors for long periods of time, or when mosquitoes are most active. Clothing should be light colored and made of tightly woven materials to keep mosquitoes away from the skin. Can pets and livestock get WNV infection? Horses can become infected with WNV if bitten by mosquitoes that carry the virus. There is a published report of West Nile virus isolated from a dog in southern Africa (Botswana) in 1982. West Nile virus has been isolated from several dead cats in 1999 and 2000. A blood of dogs and cats in the epidemic area showed a low infection rate. What signs of infection should I look for in domestic animals? West Nile virus and other mosquito-borne viruses can cause encephalitis in domestic animals. Sick animals may have a fever, weakness, poor muscle coordination, muscle spasms and signs of a neurological disease, such as change in temperament or seizures. What should I do if I suspect my pet has WNV? If your animal is sick, contact your veterinarian. The veterinarian will evaluate your animal, provide treatment and forward samples for laboratory testing to rule out other possible diseases. The Illinois Department of Agriculture can help veterinarians determine if WNV is the cause once the illness is reported. Can you get WNV directly from birds, game or domestic animals? The risk to humans and domestic animals is from the bite of WNV-infected mosquitoes. Although there is no evidence of human infection from handling infected live or dead animals, the U.S. Centers for Disease Control and Prevention recommends that anyone handling sick or dead animals avoid bare-handed contact. Hunters should use gloves when cleaning game animals and persons disposing of dead birds should use a shovel, gloves or double plastic bags to place carcasses in a garbage can. After disposing of the carcass, thoroughly wash your hands with soap and warm water. Veterinarians should use normal veterinary infection control precautions when caring for a horse suspected to have this or any other infection. Is there a vaccine for pets and livestock for WNV? A vaccine is available to protect horses from WNV infection; vaccines for other domestic animals are not available currently. How is WNV infection in domestic animals treated? As in people, there are no specific treatments for WNV infection in domestic animals. Treatment is primarily supportive to lessen the severity of the symptoms. How can I protect pets and livestock from WNV infection? You can reduce the risk of WNV infection in animals by minimizing their exposure to infected mosquitoes. Where can I get more information on WNV? Call your local health department or the Illinois Department of Public Health at the telephone numbers listed below. Or visit the Department's Web site, <www.idph.state.il.us> and the U.S. Centers for Disease Control and Prevention's West Nile virus site at < http://www.cdc.gov/ncidod/dvbid/westnile/index.htm>.